Please note this email account is not checked on the weekends. Or ask a question via the form below. Please note you are contacting the country club. 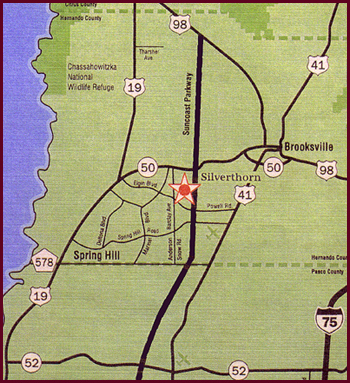 If you are looking for information regarding the Silverthorn community, you must contact them directly at (352) 848-0020 or go to their website. We are not connected to the community and will not be able to answer your questions. Thank you. Go to Google Maps for specific driving directions. Take a right (west) on to Powell Rd. Take a right (north) on to Barclay Ave.
Silverthorn's main entrance will be two blocks down on the right. Take SR 50 West 17 miles to Barclay Ave.
Take a left (south) on to Barclay. There will be a Sunoco gas station on your left. Go about two miles and Silverthorn's main entrance will be on your left. Take SR 50 East to Barclay Ave.
Take a right (south) on Barclay Ave. There will be a Sunoco gas station on your right. From US 19 N take a right (east) on to Spring Hill Dr.
Take a left (north) on to Barclay. Exit West on Spring Hill Dr.
Take a right (north) on to Barclay.